Although the handles have broken on this piece, it is an excellent example of a large Edgefield District jar. The second lip, commonly known as an “ant lip,” was filled with water. Insects trying to make their way into the contents of the jar would either drown or be deterred by the obstacle. Many feel that glass jars marked the decline of the Edgefield tradition. Its invention made stoneware unnecessary for food storage. Great but I would like to see SC Hallmarks. Thank you for any help you may render. 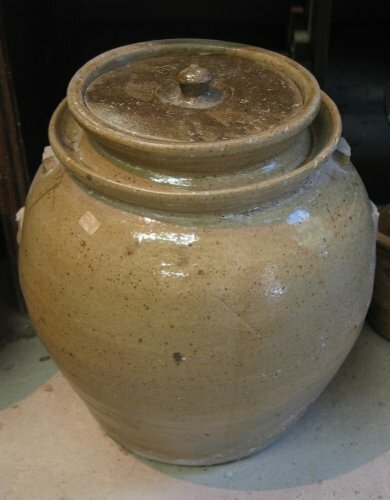 I am interested in an earthenware/stoneware to make “SourKraut” in approximately 4 gallon in size. Do you have or make anything as I have described? If so, would you give me an estimate or quote of the cost? I appreciate your help. Thank You.